Here's something you may have never tried... breakfast potatoes tinged with cinnamon and sugar. I liked the the combination of sweet and salty. It paired well with a Corny Pepper Jack Frittata that I'd made. I wasn't sure I'd like cinnamon and sweetness intermingling with my bites of egg, but I definitely did. The recipe was submitted to the site by 'Caroline' way back in 2006. I basically halved the recipe this morning (July 2013) using 5 quite large fingerling potatoes and cutting all the other ingredients in half, except for the butter (I used every bit of that). My only note would be to stop cooking these as soon as they become tender with just hints of crispness. The reddish brown cinnamon makes them look done before they're actually ready. In a small bowl or cup, combine cinnamon, sugar and salt. Carefully, place potatoes and onions in skillet. Sprinkle with sugar/spice mixture and stir all with spatula. Fry until potatoes are golden brown. Stir and flip with spatula occasionally for even browning. Add pepper and additional salt to taste. Serve as a side dish with eggs, omelets and other breakfast favorites. 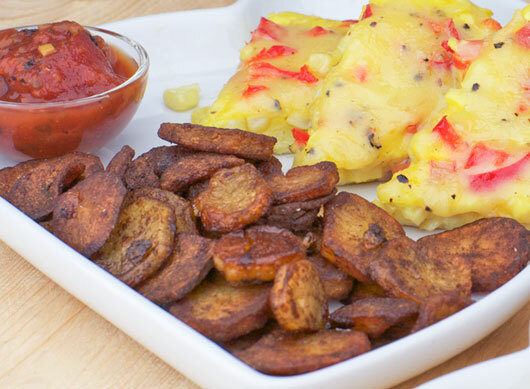 This is a fun twist on traditional breakfast potatoes. 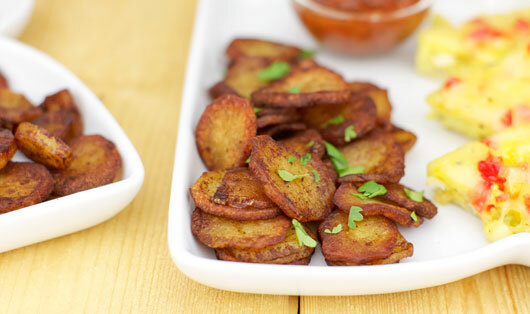 I like these cooked until the potatoes are crisp (about 15 or 20 minutes) and I find it helps to brown more evenly if I cut the potato pieces in half after I've sliced them. Recipe number 1702. Submitted 4/4/2006.